Add a splash of fun to bath time with our soft and absorbent bath towels. Colorful, cozy and made-to-last, these towels feature whimsical designs that will become their new favorite way to end fun in the tub. 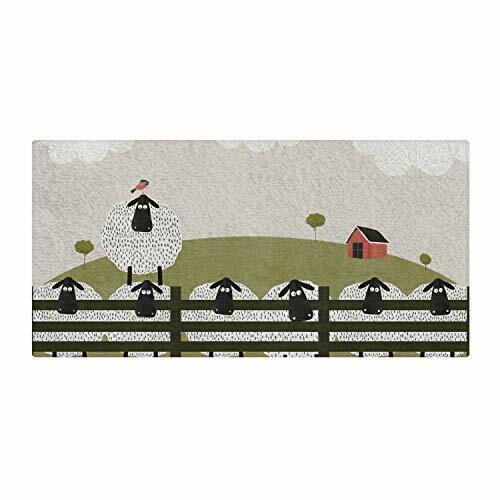 The Counting Sheep Farm Animals Towel, designed by Mel Armstrong, is 100% polyester and will maintain it's beautiful, vibrant colors wash after wash. Our exceptional quality is backed by our outstanding customer service. Each bath towel is made to order and printed and assembled in the USA. SIZE + COLORS: Bring fun and joy into the bathroom with cozy, absorbent bath towels designed to keep up with every bath time adventure. Bold colors stay true, wash after wash. Our towel measures 60x30. Bath time, beach time and pool days have never been more fun! MATERIAL: Made of cozy, absorbent 100% polyester. The Mouse + Magpie Bath Towel is easy to care for. Simply wash on cold with like colors and mild detergent, tumble-dry low. Colors maintain wash after wash. Do not bleach, dry clean or iron. OUTSTANDING QUALITY: Our exceptional quality is backed by our outstanding customer service. Each bath towel is made to order, printed and assembled in the USA. GIFT-WORTHY: Mouse + Magpie Bath Towels are exclusively designed by our community of independent artists. Its one-of-a-kind nature makes it a perfect and unique gift for the special little one in your life. DESIGN: Created by Mel Armstrong. One sheep, two sheep, three sheep, zzz! Let your child drift to sleep by counting these adorable barnyard sheep. Sweet dreams, little one. If you have any questions about this product by Mouse + Magpie, contact us by completing and submitting the form below. If you are looking for a specif part number, please include it with your message.